My paper entitled "Empirical Ethics and the Duty to Extend the "Biological Warranty Period"" has been accepted for publication in the journal Social Philosophy and Policy. The world’s aging populations face novel health challenges never experienced before in human history. The moral landscape thus needs to adapt to reflect this novel empirical reality. In this paper I take for granted one basic moral principle- a principle of preventing bad occurrences (Peter Singer, 1972)- and explore the implications empirical considerations from demography, evolutionary biology and biogerontology have for the way we conceive of fulfilling this principle at the operational level. After bringing to the fore a number of considerations Singer ignores, such as the probability that non-intervention will result in harm and the likelihood that different kinds of extrinsic and intrinsic harms can be prevented, I argue that the aspiration to extend the human biological warranty period (by retarding the rate of aging) is a pressing moral imperative for the 21st century. In the final sections I briefly address some standard objections raised against life extension and conclude that, while there may be some legitimate concerns worth addressing, they are not compelling enough to provide a rational basis for forfeiting the potential health and economic benefits which could be realized by extending the biological warranty period. In the video presentation above I detail part of the argument advanced in the article. The article itself is over 40 pages in length, so the video is a brief summary of some of the substantive parts of the argument. Above is another brilliant Ted Talk by Ken Robinson. Enjoy! 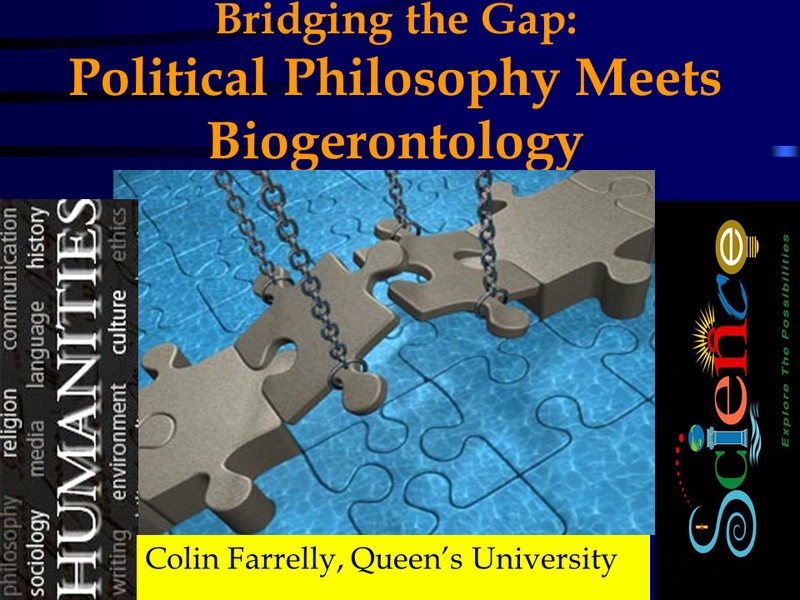 Ottawa Talk on "Bridging the Gap"
Last week I was a guest speaker at this interesting event in Ottawa where I gave a 30 minute talk titled "Bridging the Gap: Political Philosophy Meets Biogerontology". In 1959 the British scientist and novelist CP Snow gave a lecture in Cambridge titled "Two Cultures". Snow argued that the intellectual life of western societies was polarized between two traditions- that of scientists and that of literary intellectuals who had very little understanding of, and appreciation for, science. Half a century on and many of Snow's concerns are still with us today. In this talk I will emphasize what I see as the troubling gulf between the humanities/social sciences and the natural sciences. 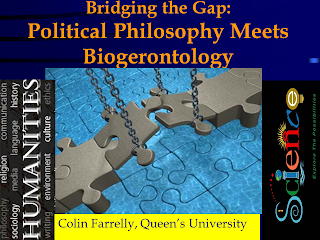 My talk will focus more specifically on the disciplines and issues I have encountered in my own research, but I think these experiences can be usefully made into some generalizations about how to bridge the gap between the humanities/social sciences and natural sciences. All scholars in the humanities/social sciences and natural sciences share perhaps one common aspiration-- they believe the knowledge they aspire to create and disseminate can make the world a better place. But once one gets down to the details of this aspiration (e.g. what are the world's most pressing problems, how can they be remedied, etc. ), there is often a significant degree of disagreement and misunderstanding between scholars in different academic disciplines. Why is this so? (1) the world is an extremely complex place. (2) humans engage in different types of "categorical thinking" to make sense of the complex world we inhabit. In order to make sense of our surroundings it is common, perhaps even inevitable, that we engage in some sort of "categorical thinking" to make sense of it. Suppose, for example, you see a group of 10 people coming down the street towards you yelling and making loud noises. At first you might try to make sense what you are seeing by categorizing the group by the age of the people you see: are they kids, teenagers, adults? You notice that they are a mix of age groups- some are children, some young adults and some seniors. Some people are tall, some are short. None of these categories helps you make sense of this group's actions. They get closer and you notice they are all wearing the same clothing-- a Toronto Maple Leaf shirt! So you categorize this loud group of people as "Leaf fans". They are yelling and making noise because they are cheering for their favorite hockey team that is trying to advance in the playoffs. This kind of categorical thinking helps us make sense of the world. These categories extend a relatively narrow historical lens-- they help make sense of the world, at best, over the span of only a few centuries or millennia. I teach the history of political thought and we always start with the Ancient Greeks- Socrates, Plato and Aristotle. These thinkers are treated as the origin of western philosophy and political thought. The historical lens does not extend beyond 3000 years. One distinctive feature of the outlook of (most) scholars in the humanities and social sciences is that we focus only on the proximate history of humanity, and typically the role of human agency within that history. The focus is on the history and legacy of colonialism, the creation and evolution of patriarchy, property, and government. This stands in sharp contrast to the view offered by the natural sciences. Rather than categorizing the world into distinctive nations, ethnicities, religions or economic or political systems, biology categorizes all of us into the same category-- we are members of the species Homo Sapiens. And far from being the center of the world (and history), our species is only one of a countless number of species that have lived on this planet in the approximately 3.8 billion years since life began on Earth. The evolutionary biologist Theodosius Dozhansky famously remarked that "Nothing in Biology Makes Sense Except in the Light of Evolution". That is a vastly different perspective than the one typically adopted in the humanities and social sciences, where scholars attempt to make sense of the world without much reference to, let alone a basic understanding of, evolution. The extensive historical lens of evolutionary biology dwarfs the minute scope typically adopted by disciplines in the humanities and social sciences. At its best, the historical lens of the humanities and social sciences is a proximate, human-agency focused lens. No doubt this perspective is important, but it is also very limited. The different kinds of categorical thinking employed by different academic disciplines can impair the integration of the different types of knowledge needed to help improve the opportunities humans have for living flourishing lives. My field of research is political philosophy. Political philosophers examine political concepts and ideals like equality, freedom and justice. We attempt to bring precision to these contested concepts (e.g. equality of what?) and critically assess the viability of rival accounts of normative aspirations. The goal of such an intellectual exercise is, at least for practical oriented political theorists like myself, to help us develop emancipatory knowledge. Ideals of equality and justice, for example, can help us critically reflect upon, draw attention to and redress or transform patriarchal traditions, non-democratic traditions or the shortcomings of a market society, etc. The most influential political philosopher of the 20th century was the American philosopher John Rawls. Rawls’s theory of “justice as fairness” helped revive the social contract tradition. To make the task of deriving the principles of justice a manageable one for the philosopher, Rawls made a number of “simplifying assumptions” in his theory. One assumption, the one most central to what I want to say today, is that all parties to the social contract are assumed to be healthy, productive members. In other words, Rawls assumes that society consists of adults that have the health prospects of your average 20-year old! No such “ageless” society has ever existed, nor is any such society likely to come into existence (at least not any time soon). Humans age. And the world’s populations are aging. This is a new (and very significant) development in human history. Fertility rates are declining and significant progress has been made with reducing early and mid-life morbidity and mortality. That is a success story. But it is one that also presents a significant challenge for us—how to promote health in late life. The interventions needed to improve health in late life will need to be very different than those employed to tackle infectious disease and poverty. To help re-orient the categorical thinking employed by contemporary theories of justice, it is worth emphasizing the latest global mortality rates from the Global Burden of Disease Study. This study examined mortality rates over the past 4 decades for 187 countries in the world. In 1970 there were 3.7 billion people in the world, and life expectancy at birth was 59. By 2010, global population was close to 7 billion, and life expectancy at birth surpassed age 70 (67 for males, just over 73 for females). The United Nations estimates that global life expectancy will reach 80 by 2100. There are 784 million persons in the world age ≥60, and that number will rise to 2 billion in 2050. 2050 will mark the first time in human history that the number of persons age ≥ 60 will outnumber the number of children (age 0-14 years) in the world. These estimates are extremely significant. They indicate that the world has changed in significant ways. In 1970, human deaths were dominated by infectious disease. Small pox still existed. By 2010, the chronic diseases of late life had become the leading causes of death in the world. This reality requires us to exercise the intellectual virtue of adaptability of intellect. We cannot think and act as if we continue to live in a world where the extrinsic threats of the world pose the greatest risks of morbidity and mortality. The intrinsic limitations of our biology are now, for the first time in human history, the major cause of suffering, disease and death. Once ideas of justice are integrated with insights from demography, evolutionary biology and biogerontology, we realize that many of the modes of categorical thinking employed in the past must be revised. Not only should we aspire to emancipate humanity from patriarchy, colonialism and poverty, we should also aspire to emancipate humanity from the biological priority evolution by natural selection places on reproduction over longevity. This trade-off now results in unprecedented numbers of human beings suffering painful, chronic, and costly diseases. By transcending the limitations of the proximate (human-agency focused) understanding of history, scholars in the humanities and social sciences can begin to take human biology seriously as something that should inform our ideals of equality and justice. Doing so might help us create the emancipatory knowledge needed to meet the demands of justice in the 21st century.